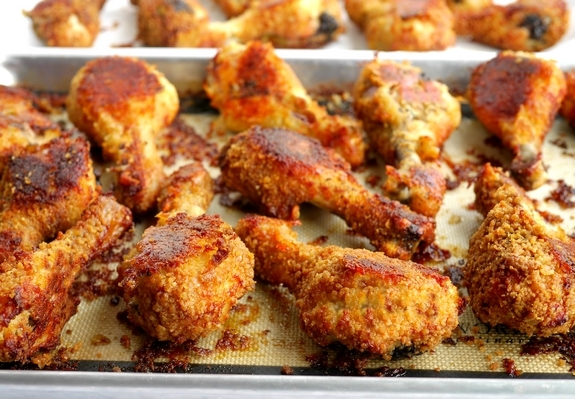 These Potato Chip-Bisquick Oven “Fried” Drumsticks are crispy, crunchy and delicious without ever getting out the fryer. It’s delicious right out of the oven and throughout the week for leftovers. I have been working on trying to find the best ingredients it takes to make a crispy “oven fried” chicken and I think I’ve finally nailed it. This is the chicken you are going to take on picnics. It is fabulous warm, cold or at room temperature. It’s perfect for all those summer concerts in the park. Let’s face it, there is really nothing better than chicken drumsticks on picnics. Normally, I just make a batch of my Crunchy Lemonade Drumsticks or Bert’s Southern Fried Chicken, but I am so in love with recipe, I’m going to make it my summer go-to when it comes to making chicken. I tried different brands of chips for their flavor and texture, but I ended up preferring Lay’s Potato Chips the best…the dill pickle flavored ones transfer the most flavor, imagine that, however, the chicken does not taste like dill pickle in the end. I toss the chips and Bisquick into the bowl of the food processor to make the coating mixture. I normally make ten pounds of drumsticks at a time. These drumsticks are perfect for lunches and dinners over the next week, so it’s worth it to make a large batch. Get the best quality, meaty drumsticks you can, it makes such a difference. Ten pounds of drumsticks fit nicely on three large, rimmed baking trays. The chicken turns out best when made on a silicone mat. If you don’t have a silicone mat I would just use aluminum foil. Does this look insanely delicious or what? The potato chips and chicken, along with the mayonnaise rub down work together to create the perfect flavor and crunchy coated chicken. It’s seriously so good and I can’t wait for you to try it. Again, try to make a big batch, but you can easily halve the recipe if that works better for you. 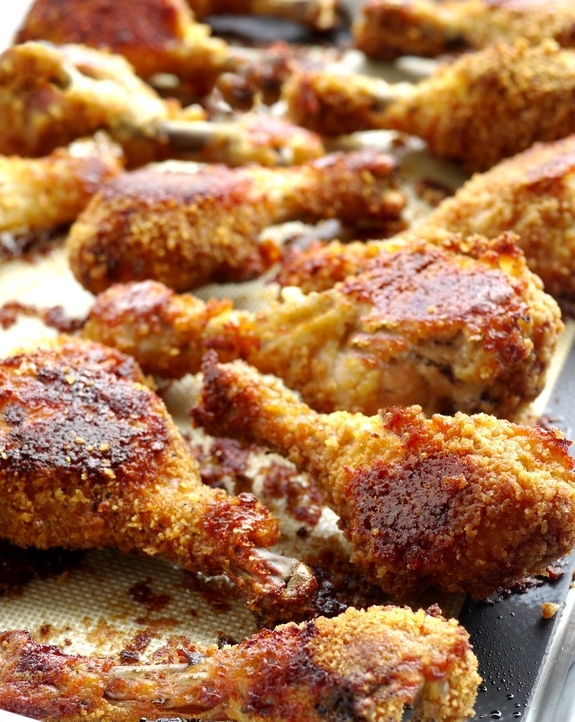 There are so many fabulous ways to make crispy drumsticks in the oven. These Crispy Baked Buffalo Drumsticks are going to be perfect for game day entertaining, while these Sweet and Spicy Baked Drumsticks have a zesty Asian flavor and a kick of fiery heat. I am always thinking about these Brined and Glazed Hoisin Drumsticks (my family begs for them often). And I just found this recipe for Tabasco Brined Spicy Drumsticks that sounds unreal along with these Greek Style Drumsticks…not sure which one to make first!! Four years ago I shared with you a recipe for Creamy Gnocchi with Walnuts and Fried Sage, I hope you’ve had time to make it because fried sage is amazing. And nine, long years ago we made healthy Chocolate Malted Muffins together that were amazing. Give them a try if you haven’t already. Preheat oven to 400 degrees F for a regular oven or 375 degrees F for a convection oven. Add potato chips and Bisquick to the bowl of a food processor and pulverize into a nice crumb mixture. (Depending on the size of your food processor bowl you might need to add the chips in batches.) Place mixture into a large plastic bag and set aside. 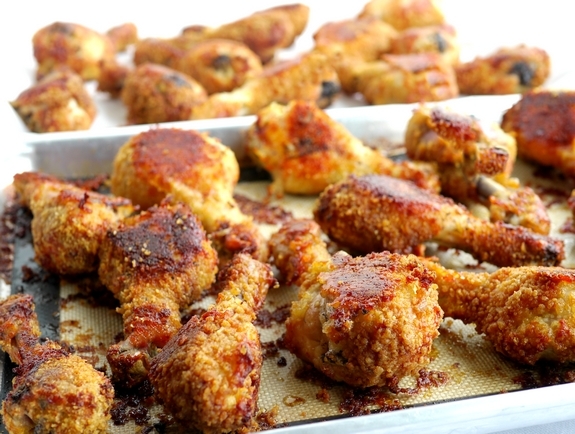 Season each drumstick with black pepper. With your hands, slather each drumstick with mayonnaise. 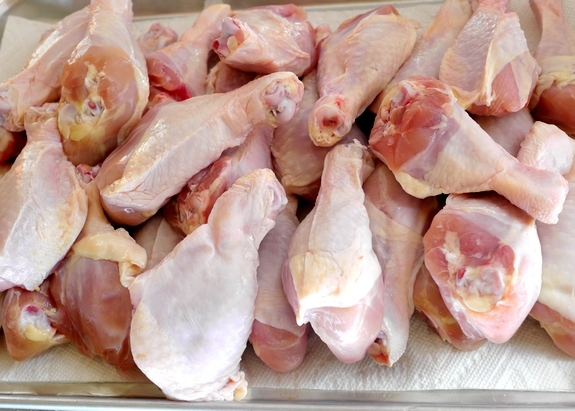 Drop each piece into the plastic bag with chip mixture, shaking vigorously until each drumstick is completely coated. Repeat until all drumsticks have been coated. 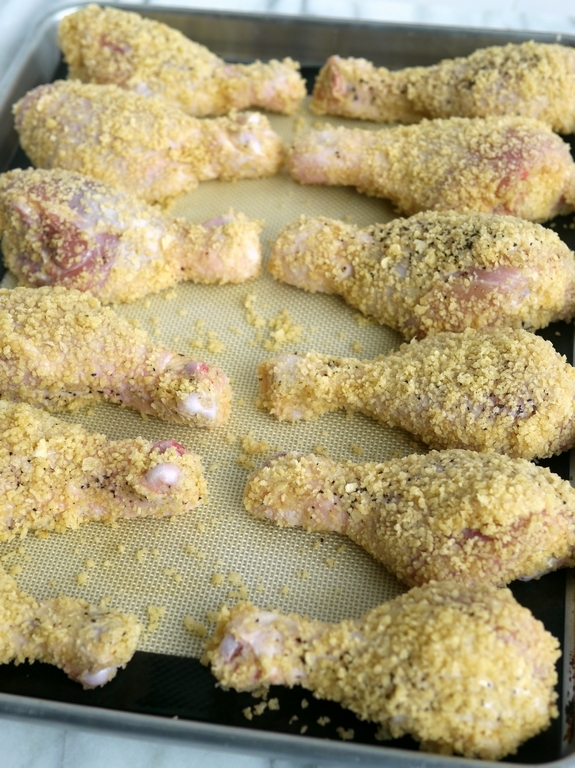 Place drumsticks onto three rimmed baking sheets that have been fitted with a silicone mat or aluminum foil. Mist chicken with cooking spray. Bake on three levels in the oven for 35 minutes. Pull out each tray and turn over each drumstick. Return to the oven and bake for another 40-45 minutes until done and chicken has reached 165 degrees F.
Cooking notes: I make my drumsticks in an oven that has both a regular and convection setting. Since this is a large batch of chicken, I use all three shelves of the oven and bake on my convection setting at 375 degrees F for the times indicated. If you are baking on a regular setting, use 400 degrees F as your temperature and when you remove your chicken to turn the pieces, I would suggest rotating the pans for more even cooking. Rotating pans is not necessary if you are baking on a convection setting. Wow, potato chips and bisquick, I bet those are crispy! Oooh, those look so good and so perfectly crispy! It’s always the crispiness and crunch I miss when you don’t fry. This is perfect!! Me too, this definitely makes up for that. 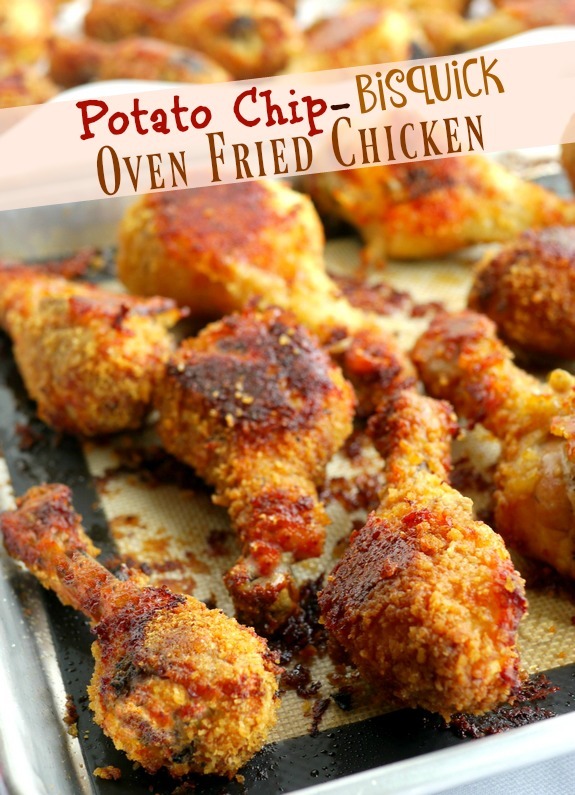 I’ve been looking for a “fried” chicken recipe to satisfy my husband’s cravings! This looks perfect, thanks!! Wow! These potato drumsticks look sooo delicious! My husband will be obsessed with this! Oh boy this is sensational. I need to make this for my family. Can I use a cut up chicken instead of just drumsticks, like white meat also. Yes but cooking times are going to vary greatly. Hello……I am in the UK and would love to try this recipe, but what is Bisquick please? Bisquick is a pre mixed baking mix that comes in a box. It is used to make biscuits, pot pie topping, pancakes, etc. Ours in Canada coed in a yellow box. Hope this helps! Looks simple to make and has good reviews, going to try it. Can you do this with thighs and breasts? Sure but cooking times will be different. Hello! I made this chicken and my family loved it! However I’d like to mention that using aluminium foil will make chicken stick to the foil and crumbs were falling off the chicken pieces when I tried to turn them over. 🙁 We ate the crumbs with a spoon… Next time I will make it using parchment paper and on a slightly shorter cooking time due to my oven. Love this recipe and thank you for sharing!! Could these be prepared ahead of time for a big crowd and then frozen? Will they reheat crispy? I have never frozen them so I can’t promise how they will be once reheated. Sorry. I made this for a dinner party with my family, siblings and their spouses and it was a huge hit! My kids (ages 3 and 5) LOVED these drumsticks! Perfect recipe and instructions! It was delicious! food processor it occurred to me that the extra mixture will work wonderfully to coat my salmon patties! I am moving forward with the chicken but look forward to trying the salmon too. I made this and it is great! Would be good on salmon too! This sounds great and so easy! My hubby and I prefer chicken breasts and I saw that you told someone that this recipe would work for them. I’m wondering how long to cook them and at what temperature? Also, my Silicone mat says not to use above 400 degrees; have you had any problems with damage to yours. Thanks for all your help!!! I have not had any issue with mine. Just thought of one other comment I wanted to make. In Ohio we can get non-stick Reynolds aluminum foil. It’s the greatest and would sure help out those people who don’t have silicone mats…. If making a small batch and needing only one sheet, if using a regular oven, is rotating to each level required still? Looks so yummy don’t want to mess up! Would dipping in egg instead of mayonaise work well too? You can do that. They just turn out better with mayo. 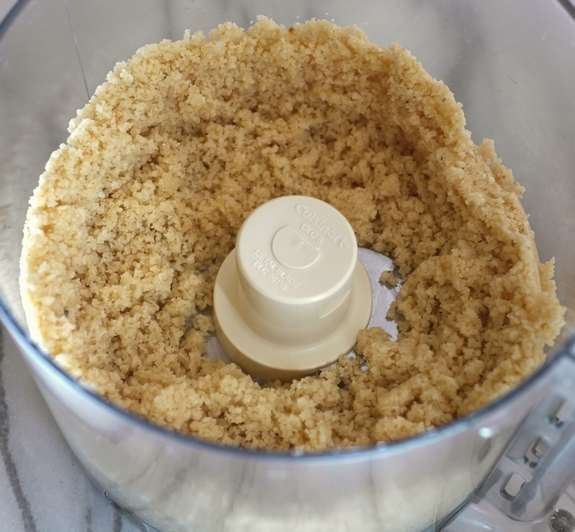 What if you don’t have a food processor? Could the chips and briskets be blended in a blender or by hand? It will depend on your blender if it can get a fine crush or not. Can you use Gluten-free Bisquick for this recipe? I’ve never tried that, but I don’t see why not. I have them in the oven right now using a mix of sour cream & onion and cheddar & sour cream chips (a great way to use up the bottoms of the bags!). My husband is sure he is going to starve to death before they get done! Tried your recipe using chicken thighs; turned out great! Nice ‘n golden brown and crispy (just like fried)! Will be making it again soon. Thank you. I’ve made this a few times. It’s great!! Love it and thank you!! It’s delicious!